Branching Headphone Splitter | OhGizmo! The RIAA might try and do everything in their power to stop you from sharing your music collection digitally, but their hands are tied when it comes to old-school analog methods. 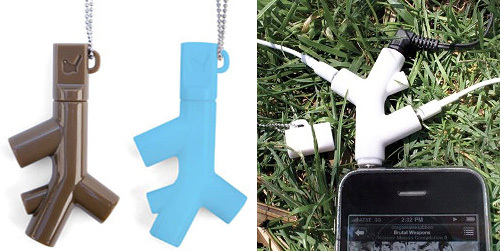 So if you happen to find yourself on the beach with some friends today, Kikkerland’s branching headphone splitter will let you share that 4th of July playlist you spent all weekend making with up to 2 other people. You read that right! While most splitters only let a couple of people use their headphones with a single device, this one pushes the limits to 3 listeners at the same time! And it’s available in 3 colors right now for just $10 from Kikkerland. You don’t have to wait almost an entire year for the designer to work out the kinks on the white version. I have a pair of Fanny Wang headphones and love them because not only do they look and sound awesome, they come with one of these splitters already attached. You should definitely check them out if you want some really great headphones that allow you to share what you’re listening to with friends.